Ben Heine is a phenomenal Belgian, self-taught multidisciplinary artist. 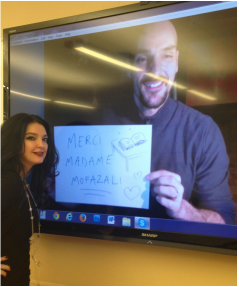 On March 5th, Collingwood’s French 11 students had the unforgettable opportunity to interact with him through Skype. Since the class wished to celebrate Ben Heine’s successful “Pencil vs. Camera” series, everyone created an original piece of artwork for him. During the Skype session, Heine was very friendly and provided constructive criticism and praise for every submission. Apart from offering encouraging words, Heine was able to meticulously answer all the students’ questions. Karna Nilakantan is a very humorous grade nine individual in the class. His opinion on the Skype conference was that "It was the best moment of my life meeting my new found hero, Ben Heine." Another grade ten student, Olivia Armstrong, shared a different perspective. She admitted that, "I was really nervous to talk to someone pretty famous, especially since he was judging our artwork. In the end, he turned out to be a relaxed and funny guy, who helped my nerves. Overall, it was a great experience, and I'm so happy I met him." The experience to be able to interact with a prominent artist was a true privilege. Not only were the Collingwood Grade 11 French classes lucky to receive some instruction in art, they were also lucky to learn about Belgian culture. Below is a selection of French 11 students' art inspired by Ben Heine's "Pencil Vs Camera"